These beautiful little possums have a body that grows to about 13 cm long and a tail that grows 16 cm long. They are excellent climbers and have a prehensile tail for grabbing branches, but spend most of their time on the ground. Mountain pygmy-possums are very unusual as they are the only Australian marsupial that hibernates. They live in very cold climates so they fatten themselves up, roll into a ball and sleep for a few months during winter. They look cute and fluffy, but they are excellent hunters, catching and eating large numbers of Bogong moths. They also eat berries and seeds, when the moths migrate away. 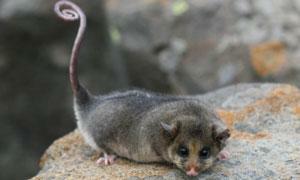 Mountain pygmy-possums were only discovered in 1966 and are very rare. They are only found in three sites in the alpine regions of Victoria and New South Wales. There are only about 2,000 left in the wild and the numbers continue to drop due to global warming, introduced foxes and cats, and developments for the ski industry where they live. Thankfully a successful breeding program is being conducted to save these lovely marsupials from becoming extinct. Are there any other interesting facts that you would like to share about mountain pygmy-possums?